Drakes Restaurant and Bar offers a range of tempting Brasserie-style meals to savour, while Nelson's Lounge is the perfect retreat for afternoon tea. Guests can also enjoy an extensive wine list, which is exclusive to Mercure hotels. The hotel boasts six dedicated meeting-rooms, with the largest able to accommodate 250 guests. With elegant décor and plenty of facilities, there's something for everyone. Whether visiting for business or pleasure, be sure to make the most of your stay. Ideally located opposite Exeter Central Station and 15 minute's walk from Exeter St. Davids Station. For those driving, the hotel has 26 car park spaces which are available on a first come, first served basis and charged at £10. 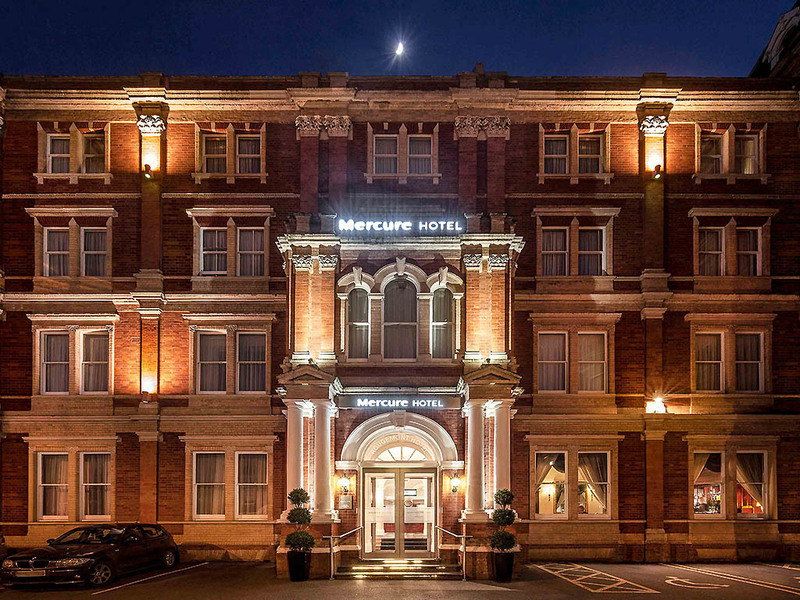 At Mercure Exeter Rougemont Hotel, we have 98 bedrooms, including Deluxe rooms and Suites. All of our bedrooms include free unlimited WiFi, coffee and tea making facilities, flat screen TV, hairdryer, iron and ironing board. Traditional lounge setting located in the lobby of the hotel ideal for intimate evening dining, afternoon tea and we also serve speciality coffees. The situation of the hotel was ideal for us, opposite Exeter Central station and within walking distance of the town centre and riverside. The room was well-equipped, quiet and comfortable, but not very big and it lacked clothes storage space for a longer stay. The breakfast was excellent, the staff friendly and helpful. Our stay was spoilt by a noisy stag party repeatedly knocking on our bedroom door throughput the evening and waking us up at night. The 2am knock resulted in one of our party getting no further sleep. The hotel’s position in Exeter City Centre is excellent and the staff were fine. We had several issues during our stay of 48hrs. Our planned dinner on the first night in the dining room had to be abandoned and the alternative of the Drake’s bar was rather depressing and lacking in any atmosphere. The room which had obviously been divided by an inadequate stud partition was completely unsatisfactory.On the two nights of our stay we were woken up by voices talking in the next room. The fire door closure needs looking at- very noisy to use. The towels were almost threadbare and discoloured.These problems could easily be sorted out by the management and I suggest you do the necessary investigations. We raised our concerns about the noise with one of the receptionists. Staff apart from the nice lady on reception were exceptionally rude. I asked for breakfast to be brought to my room on my day of arrival and got charged twice. Rude staff member bringing the card machine to my door after already delivering breakfast. Hotel room lovely and clean but extremely stuffy and hot. Hence two fans in the room. As usual the staff look after us brilliantly. Not the very cheapest, but that was not what we wanted. Reception where great people with very little corporate brand about them. Very natural helpful people. Breakfast was well peopled with staff to help, more than adequate choice of food. Evening meals available else where. The only downside of our stay was the thin bedroom walls, rather surprised for the age of the building. The best bit was walking up the main staircase. Just try it and you'll see what i mean. Our experience was mixed. Bedroom staff friendly and courteous. Reception staff a bit curt on the whole. Eating facilities very limited. Breakfast good. The evening food service in the hotel was terrible every single night of our two week stay. The staff were unable to cope with more than a couple of orders leaving us with waits of an hour for simple meals, cutlery was forgotten and deserts some times didn't arrive. This was simply not good enough for a hotel which rates its self as four star. Meal times became something that we came to dread rather than enjoy. Stayed for one night on a fleeting visit to Exeter. We booked a small double and I was pleasantly surprised with the space in there. Had everything we needed, it was clean and quiet. Staff were friendly and the hotel is in a great location. Uncomfortable night and felt anonymous to staff. The hotel decor is pleasant as was my initial greeting but thereafter I found the staff rather indifferent. When passing staff in the hotel not once did anyone smile let alone say hello; the lunch time staff were sullen. I was unable to sleep due to rock hard pillows therefore telephoned reception but received no answer. The lock to the bathroom was faulty which I had intended to mention to reception on checking out but the receptionist hardly acknowledged me and did not enquire about my stay, merely took my key; I didn’t even receive a thank you for staying. I’ve never stayed at Mercure Hotel before and must say that I am far from impressed with their customer service. Room and room services good. Staff very helpful. Quality of food and bar fell short of the expected. Enjoyed my stay. Clean, comfortable room with very helpful staff. Desk staff very friendly and helpful. Room clean and comfortable. Breakfast was great. Managed to park our car without any problems. Great location in Exeter - very close to shops and restaurants, and across the road from the park.